When the Parent Association offered iPads to residents at Athena Day School at Plymouth Rehabilitation and Health Care Center (formerly Radius), the staff and families were skeptical. “My son was never very aware of his surroundings before; he never reached for things or moved his hands in a purposeful way,” said Cindy Murray, mother of a 20-year-old who lives at the Massachusetts Pediatric Center and attends the school. “Then I saw how he reacted to it!” The iPad captivates him, Cindy said. Kim Nickerson, instructor in the adult (over 22) services, said even individuals with highly contracted hands can use the iPad because it can be programmed to adjust to the owner’s touch. The possibilities seem so limitless, the staff organized a weekly iPad group to share exciting ways to use the tablet. Unexpectedly, the iPads also help families stay involved with their kids. Cindy Murray downloads music and stories to share with her son; other parents use Facetime video calling to stay in touch. Grace Lawson, who headed up the parent association for 20 years, recommended the iPad purchase after seeing a video on how it helped boy with autism. For more information about Plymouth RHCC or the Athena Day School visit www.plymouthrhcc.com. On a Monday morning a little more than a year ago, Cedarcrest Center had a watershed moment. It was the first time Cedarcrest Center, New Hampshire’s only pediatric intermediate care facility, was able to respond to the growing need for post-acute care options for children who are ventilator-dependent. This historic occasion was the culmination of a strong collaboration among members of the New Hampshire healthcare and disabilities communities. Extremely premature births often result in high-risk neurological or neuro-muscular conditions, hypoxic brain damage or chronic lung disease. Children who survive do not typically require continued hospitalization once they become medically stable. However, the transition from hospital to home can be affected by homelessness, family crises, or insufficient community support services so back-up options are necessary. Back-up care requires specially-trained caregivers and advance planning to arrange related support services. Since many families in New Hampshire live at considerable distance from a major medical center, the unavailability of back-up options constituted a significant medical risk. Until that Monday, the only options had been hospitalization in New Hampshire or admission to an out of state facility. Cedarcrest Center’s medical director, nursing staff and administrators worked nearly two years with partners across the state to develop new protocols, identify and purchase appropriate back-up equipment, ensure proper staff training, and secure necessary approvals. More than a year since the first admission, the Center has provided more than 330 days of intensive nursing care to three other children who required ventilator-support – one short-term, one for a three-month hospital-to-home transition stay, and one longer term. For more information visit: www.cedarcrest4kids.org. Katie Frost enjoys watching her siblings perform in the marching band. Her mother Sue says she uses short term stays at the NEPC to balance the needs of all four children: Andrew, 18 Katie, 16, Emily,15 and Carly,10. Doctors told the family Katie would not survive after being born with fluid on the brain, but after multiple shunt revisions she is able to live in the family home. However, she experiences frequent seizures, is non-ambulatory and totally dependent on others for everything. The Frosts included Katie in all her siblings activities, but as she grew it became a challenge to transport her and she was sensitive to some environments. There were conflicts, too. Someone had to stay behind when Andrew and Em’s marching band performed at Disneyworld, because Katie can’t fly; family vacations in Ocean City had to be put on hold, because Katie can’t tolerate the sound of surf. Then a family friend volunteered at NEPC and discovered short term stays. The family applied and discovered that Katie enjoyed her short “vacations” complete with a swimming pool and a staff attuned to her special needs. So when Andrew went off to college this year, both parents attended the orientation. When husband Matt went on a business trip, a short term stay made life manageable for Sue, Emily and Carly. What is it like to be the sibling of a person with complex medical conditions? Brothers and sisters express a range of emotions: compassion, love, pride, responsibility, guilt, anger and frustration among them. 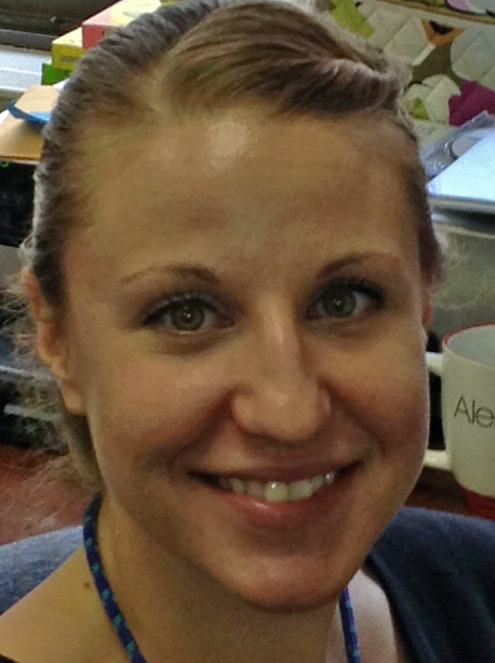 Social workers are paying more attention to family dynamics and addressing the whole family that supports a medically fragile child, according to Stacey MacLean, LSW, “because everyone is affected.” She addressed this topic at the annual meeting of the Association for Providers of Children with Complex Medical Needs (APCCMN) in October. She recommended that families who care for a child at home utilize the short term stay program at any of Massachusetts’ three pediatric skilled nursing facilities in order to spend time with their other children. She said the residential homes also have excellent programming to help families stay engaged with children who live away from home. Stacey also suggests SIB workshops based at most major hospitals to help siblings feel less isolated and share concerns. Under the guidance of professionals they can deal with feelings of guilt for being the “healthy” one or the survivor of an accident. They can role play how to deal with insensitive peers who bully them because their brother or sister is “different.” They can discuss worries over who will care for their sibling when parents eventually pass on. For more resources visit www.siblingsupport.org. Learn more about NEPC at www.nepc.org. When Gayle and I decided nearly two decades ago that Sarah would be best cared for in a pediatric nursing home, we learned how invisible children like our daughter were to other families. Few people talked about the struggles individuals and families face after an illness or accident or premature birth. Even fewer stay involved in making their lives meaningful. The H.A.L.O. Foundation strives to enlighten and inform the greater community about children with neurological impairment and the big and small victories in their lives. In this edition of H.A.L.O. Reports we share how parents, professionals and friends make life fulfilling for everyone touched by an individual with complex medical issues. The Help A Little One Foundation is dedicated to enhancing the quality of life for children with neurological impairment and the families that take care of them. Thank you for your continued compassion and kindness. 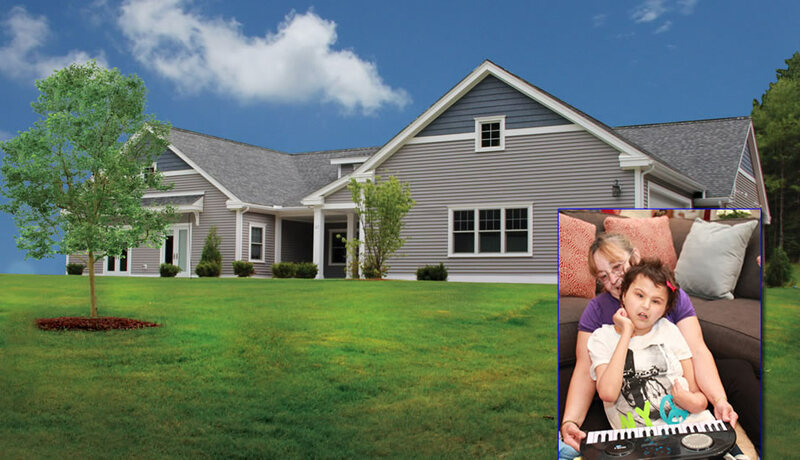 Seven Hills Community Services has built a home for medically-intensive individuals in Groton, MA. Residents enjoy all the comforts of a traditional home in rooms adapted to their needs. ﻿﻿﻿﻿﻿﻿No sign, no front desk, no announcements over the intercom. ﻿﻿Nothing identifies the neat grey, one level house on a bucolic lane in Groton, MA as a home for individuals who have complex medical conditions and physical or cognitive disabilities. But inside the Great Room, five bedrooms and spacious tub and shower rooms there are overhead lifts to move the five young adult residents from wheel chair to sofa, or bed, or bath. The kitchen is handicapped-accessible, even though only one current resident can manipulate utensils and participate in cooking. Wheelchair arms slide easily beneath the table top and medical equipment is tucked next to clothes in the closet in each resident’s private room. This medically-intensive home is one of twelve group homes built and operated by Seven Hills Community Services, an Affiliate of Seven Hills Foundation. Three homes provide a living environment for individuals who require skilled nursing services. Massachusetts first began moving people from nursing homes into community settings about eleven years ago after a lawsuit challenged the inappropriate placement of individuals with developmental disabilities in medical facilities. Until recently individuals who required skilled nursing could not qualify for the less restrictive, home-like setting. When families or guardians apply, candidates are reviewed for the complexity of their medical conditions and how many skilled nursing hours they require. Most of the current Groton home residents are non verbal, non-ambulatory and have spent significant portions of their lives in a nursing home. A nurse and at least two Direct Support Professionals staff the Groton house whenever residents are present. Thirteen staffers working shifts to provide necessary medical support and personal care, said Assistant Director Kelli Jimenez. The staff also encourages and arranges participation in the community, pursuit of individual interests and continued development of skills and abilities. “We view this as a process. Typical kids grow up and leave home. This is a form of independence for these individuals,” said Jennifer Amadon, MSN RN. She is also Clinical Nurse Liaison at nearby Seven Hills Pediatric Center, where four of the residents previously lived. Seven Hills Community Services strives to increase the individual’s personal control and independence, and contribute to the highest quality of life for each person. Nearly 200 family members, physicians, nurses, friends and community members participated in Cedarcrest Center’s First Annual KIDS CARE Walk & Roll in Keene, New Hampshire recently. Through a grassroots, on-line fundraising effort, the event generated $15,000 to benefit children with complex medical and developmental needs at the Center. Susan Maltz observes Matt as he rides his bike at the BEST Program. 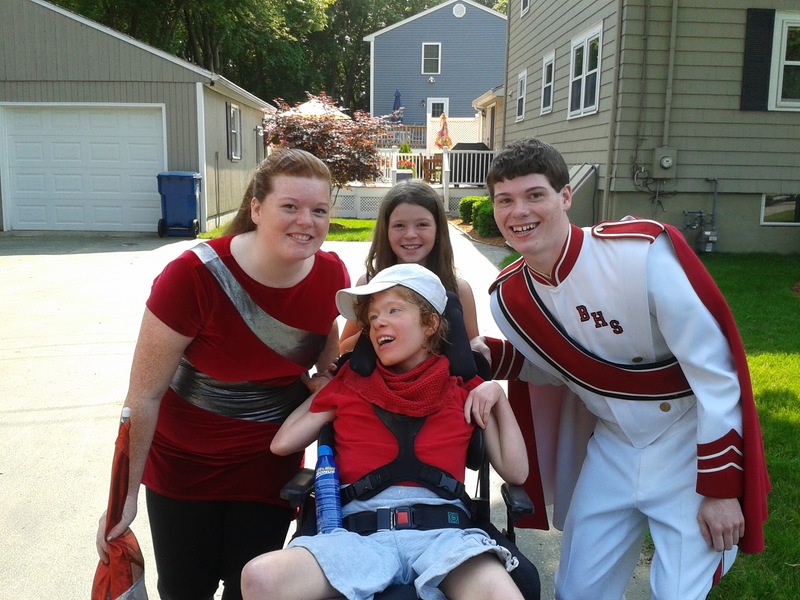 Fifteen– year-old Matthew sat around a lot after he outgrew his customized stroller. He can’t walk long distances or run due to Spinal Muscular Atrophy, but he is able to enjoy swimming in the family pool and occasionally using an exercise ball, according to his father, Bill. So when Susan Maltz, physical therapist at the BEST Program in the Boston Public Schools, saw Matt’s enthusiasm for the Rifton adaptive tricycle she arranged for his family to borrow it over the summer. 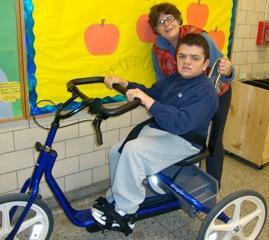 “Riding the bike gave Matt a feeling of independence and the exercise was good for him,” said his dad. “He loved it.” But when the family went shopping they realized it was going to take years to save up for this expensive bike. “We are so grateful Susan helped us apply to H.A.L.O. for financial assistance,” said Bill.